Well, that was brutal, wasn’t it? After a series of meandering episodes ranging from average to bad, The Walking Dead delivers a gut punch with “The Grove”, an emotionally resonant hour of television with some truly unsettling moments. Last year left us with a dead Governor, a decapitated Hershel, and a split group, and The Walking Dead‘s midseason premiere is a toned down, contemplative look at three characters: Michonne, Rick, and Carl. Here we go. All times central. 8:02-I don’t buy that the Governor could, in a matter of minutes, convince a whole bunch of people to compromise their morals, even in such a dire situation. I suppose it’s easier for the storyline, but come on, he isn’t that convincing. 8:07-Well, here’s one–ONE–person experiencing some uncertainty. That’s a start. 8:10-“You’re a better man…a better man than Rick.” Yeah, not very high standards there. 8:12-So Hershel’s still trying to reason with the man, and the Governor’s justification for his lack of remorse over daughter murder is “They aren’t mine.” It’s a a fundamental aspect of his character, albeit a bit frustrating; it’s kind of hard to sympathize with him when we’ve seen he can grow attached to someone he doesn’t know. He’s a kind of person that has the ability to compartmentalize, and that makes him dangerous. 8:17-To be honest, it’s nice being back in the prison. Two episodes of the Governor is more than enough; even given the attempt to humanize him, he just isn’t an interesting enough character to sustain a show. Morrissey is a fine actor, but he can’t do anything with flimsy writing. 8:19-Yeah, this conversation should’ve been had right after Rick’s banishment of Carol; again, the Governor episodes lessen the impact of the fallout over anything that happened beforehand. 8:24-Oh, we have a council now. It’s about time, Rick; you were never a good leader, and you always came off as a hypocrite. 8:25-“I don’t make decisions anymore!” I don’t know why, but this is the most hilarious line ever. 8:27-I, Frankenstein looks mind-numbingly stupid. 8:31-“There are children here.” *A few people look kind of sad* “I HAVE A TANK.” Oh, jeez, this dialogue is awful. 8:34-So if I was Lily, I wouldn’t be sitting on top of a trailer while Meghan played off to the side with NO ONE ELSE AROUND during a ZOMBIE APOCALYPSE. Look, once of the virtues of this show is the tension milked out of the action sequences, but when you forgo character work completely, everything just descends into silliness. 8:39-“We could shoot you all, and you’d shoot back.” Yes, I kind of want that right now. 8:40-“We should protect ourselves. They have guns. We should have guns, too!” Oh, make it stop. 8:42-Does Rick really believe in what he’s saying? I think the Governor’s too far gone, and Rick hasn’t had the opportunity to see his recent journey, so that was just wishful thinking there. I mean, I guess that’s beneficial at times, but what makes him different from Hershel is that Hershel has at least some sense of reality amidst his hopeful speeches. Rick seems empty behind it all. I dislike how the show’s trying to put everything on Rick Grimes; build up the supporting cast a bit in this department, guys. 8:44-RIP Hershel. Your head was nice. 8:48-Alright, so it takes the Governor decapitating someone to get some people to realize what he’s doing. In addition, I can’t help but lament the fact that Meghan turned out to be yet another plot device to fuel the Governor’s rage. Still, I think the emotional aspect of it definitely works here, and going back, given the Governor is killed off, it works better. 8:54-Pretty cool, Daryl. Also, he killed a tank. Pretty awesome. 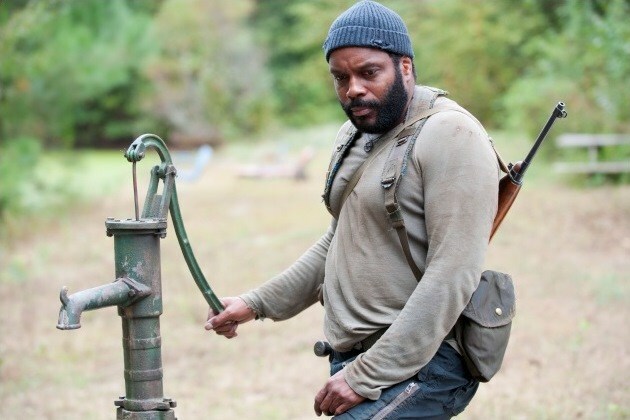 8:55-They’re coming at Tyreese with a vengeance! I’m surprised he’s not dead yet. Oh, and okay, the kids shoot some people now. Good riddance, person who got shot. 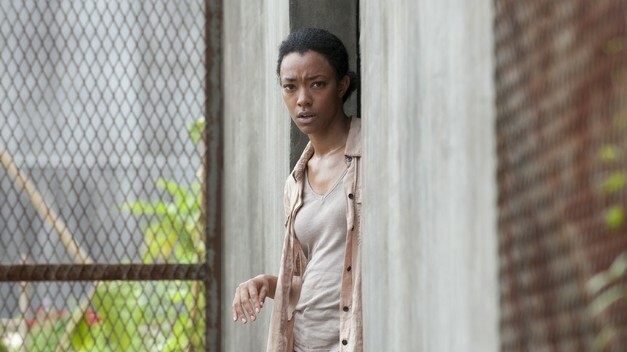 8:57-Well, it looks like the Governor’s dead, and how fitting that Michonne and Lily are the ones to kill him. He’s been corrupted by his own quest for revenge, and it makes perfect sense that he’d be the one to blame for everything. Ultimately, I do think it’s a great decision; it serves as a fine coda to his storyline, and I’m not sure how much more of him I could tolerate. 8:58-So, is Judith dead? It might be up for interpretation, but nevertheless, the fact that she isn’t there is just emblematic of what’s transpired; innocence has been lost, and although the Governor is dead, all that’s left is just soul-crushing despair. Blood has been spilled, and now they truly are too far gone. 8:59-So, this is a fantastic action sequence, I’ll give them that. I mean, I wasn’t big on everything prior, but man, these final 15 minutes are heart-pounding and fantastically shot. This show’s strength is crafting intense (albeit nonsensical) action sequences, and my, do they go all out here. It’s one of the absolute best things I’ve seen from this show. Oh, and we get Zombie Lori; strangely fitting, isn’t it? It’s just father and son now, and with one baby’s (presumed) death comes the shell of a mother. I’m impressed, The Walking Dead. This is actually a poignant ending, and it doesn’t come across as tacky like the season 3 finale did. Bravo. Credit to AMC and The Walking Dead for all pictures. I own nothing. 8:02-I don’t know why, but the idea of the Governor in a tent makes me laugh. 8:07-I guess watching the Governor as more of a human being is actually more interesting than seeing him as a cartoonish villain. I really hope we get to see that other side of him here; we saw a sliver of it with his daughter last season, but it ended up descending into craziness. 8:11-I fully expect the Governor to whip out an AK-47 and start shooting up the place. 8:22-Ah, folding your face out of sight, Governor. Symbolism! 8:24-These new girls are pretty attractive, I have to say. 8:25-So the show’s doing something really interesting here. Instead of rushing right into the clash with the prison, they’re delineating the Governor’s story and attempting to humanize him. I’ll have to wait to the end to see if it works out, but I think this illustrates an important aspect of the man’s current state of mind: he’s almost going through the motions, much as he was last year (obviously the situation is vastly different here, but still). It seems as if, as much power as he seemingly yielded last year, he’s really just a puppet to be manipulated. It may just be a weakness, but it’s a fatal one here. 8:33-This must be the story of how the Governor decided to shave. 8:36-This little girl and the Governor are a better fit for each other than Rick and Carl ever will be. 8:37-Off topic: I’m so excited for The Wolf of Wall Street. 8:42-“You can lose a lot of soldiers and still win the game.” Pretty heavy-handed reflection of the Governor’s situation there. Oh, also metaphors! Chess metaphors! 8:44-So the Governor’s starting to become attached to this family, especially to the daughter. When he smashes the guy’s head in, it’s not out of malice; it’s because he cares. I think the symbolism and connection to his own family is a bit overt here, and I just don’t buy the quick turnaround. Of course, that scene also shows that primal nature within him, but it just feels a little too saccharine now. 8:46-What’s up with all these fist bumps? 8:49-You can tell he doesn’t want to leave, but he’s the kind of guy that needs validation for everything he does; that’s why he indulged in his role as the Governor. He doesn’t necessarily want to help people now as much as he wants to satisfy himself. When his family died, he lost a big part of himself, and now, he’s essentially just looking for a fix. 8:56-That stuffed animal will give you power, Megan. 8:58-Oh man, these walker kills are pretty damn cool. Whether it be ripping out the throat or ripping a head off with a bone, I love it. THOUGHTS: So, this episode tries to humanize the Governor, and it only sometimes works; the thing is, I feel like the ambition of the writers here ultimately hurts the episode. It’s a necessary transition piece, but the interactions with the three girls are so on the nose and the metaphors so overt that it gets a bit groan-inducing. However, I do like the change of pace and I admire the dedication of the writers to re-shaping this character. So I’m trying something different today. All times central. 8:06-So it seems as if Hershel’s coming into the “Carol” role now: actually making sensible decisions and taking control of situations. He’s always been the voice of reason; it’s nice to see him doing stuff. 8:12-Alright, so Rick’s now out looking for validation. That’s not anything bad, but it’s really emblematic of him as a character; he’s so indecisive that he actually hurts the group more than he helps it. 8:15-Okay, so here’s Guy #3 with a monologue about the hopelessness of everything. 8:21-So is the rest of this episode just going to consist of a bunch of people we don’t care about dying painful deaths? I actually think that might be what the whole show is about. 8:24-So here’s another Rick thing. Okay, sure, it’s the apocalypse, but can you accomplish something when you don’t believe there’s anything at the end of the tunnel? Hershel technically is wishful thinking right now, but then again, he’s a guy that has to believe to keep going. 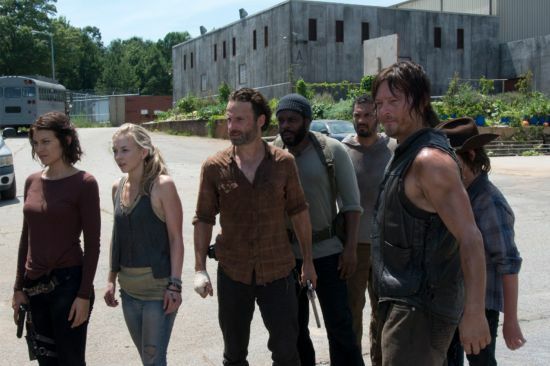 Rick has to keep moving; he can only see what’s in front of him, and that’s how he survives. He can’t stop and think. This is really a show all about the various ways we survive in the midst of utter despair, which makes me glad that this season, some people are actually, you know, cracking smiles and all that. 8:25-Alright, here we go. Walkers are opening their eyes now. 8:32-Glen’s going all Walter White now, and here come the walkers. 8:33-You know, Rick, they really could use you right now. 8:38-I swear, whenever I see a “Low Winter Sun” segment, I burst out laughing. 8:39-Oh, typical Walking Dead character: falling down while in the presence of a zombie. 8:40-There ya go, Hershel. That’s how you kill ’em. 8:41-Okay, one thing this show never fails at is crafting well-shot, intense zombie sequences. The camera work and the tension here is fantastic. Also, Carl carrying a gun makes me laugh for some reason. 8:44-But…here’s a Hershel pitfall. He isn’t willing to soil that “savior” image in front of the kids. 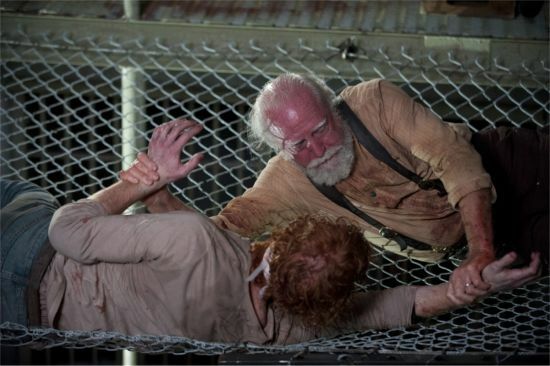 Whereas Carol was willing to do whatever was necessary, Hershel isn’t; that might end up causing his downfall. 8:47-“I didn’t want you to know.” “I had to.” Serves to support the above point. 8:49-So that’s why you don’t send a bunch of your best fighters away. 8:58-Rick still wants to garden! Honestly, what’s the point with his struggle over Carl right now? Jeez, grow up and realize what world you’re in. I get you want to protect your kid, but he’s shown you he’s matured. All in all, it’s a very solid hour complete with some great zombie action and a very well-done revelation at the end. Hopefully the Governor doesn’t turn into a cartoonish presence again; the plague was a good exploration of the unknown, and it transitions into that all-encompassing big bad. In a way, he embodies the plague. Anyway, I’m looking forward to see where we go from here. Please don’t mess up the season like last year, writers. What choices do we have to make to survive? Do we sacrifice our morals? Do we sacrifice others? These questions have the most weight in none other than a post-apocalyptic world like this one, and it’s ubiquitous throughout the course of this episode. Take, for example, Carol. At episode’s end, it’s revealed that she’s the one who burned two of the sick; it seems very rash and callous of her, but because she’s become the de facto co-leader of the prison, she has to keep her emotions bottled up when she’s around others. However, when she’s alone, as we see in this episode, she breaks down, the guilt washing over her like a tidal wave. That same guilt is felt by Hershel, but he has an opposite view: he believes that to survive, we help as much as we can, even if it means sacrificing our own lives. Carol’s all about moving forward, but Hershel’s the kind of guy that will expose himself to the contagion if it means he can help others feel better. It’s a nice thing to see someone stand up for his beliefs in this show, and while his decision may seem reckless, it’s all about perspective. We also have Tyreese going mad over his girlfriend’s death, and his fight with Rick in the cold open is devastating to watch. Coleman does great work conveying the rage, sadness, and determination throughout, and I’m enjoying seeing the evolution of his character. I’m glad he doesn’t die when he’s surrounded by all those Walkers; it would be stupid if he did (although how does he even survive? ), but I feel like that would be an easy way out for the writers, negating any sort of character buildup they’ve done with him. Anyway, it’s a solid episode with solid character development, and the final twist stirs things up a bit; it paves the way for some intriguing character dynamics, and I’m looking forward to it. -Carol, why did you knock over the water? Come on. -Daryl really Lori’d it in the car. -Carl’s huge silencer made me laugh. -Three black people go off with Daryl, and not one of them dies? We’re making progress here, show. -The show’s way of dealing with the new characters is to quarantine them all. -This is certainly a step up from the premiere; it’s a very bleak episode, and while there’s not much more to say beyond “We’re going to die!”, I’m appreciating the fact that the show is sitting down and taking a look at what makes these characters who they are. -Of course, the “Who cares?” problem still comes into play when a bunch of supporting characters are killed off in the prison breach scene. It’s well directed and very intense, but it ultimately has very little emotional resonance due to the fact that we don’t even remember any of their names. -Speaking of emotional resonance, Rick killing the pigs is probably the scene that fulfills that requirement most adequately. 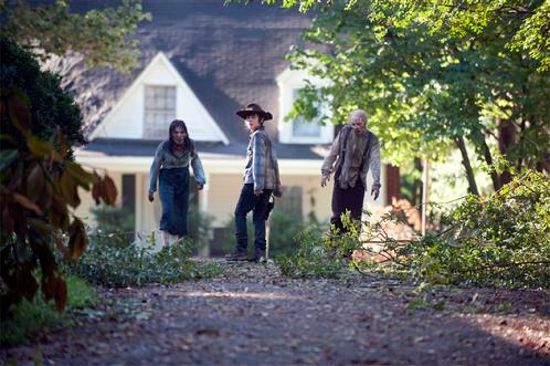 It’s a great scene for Andrew Lincoln, and it represents him moving away from his “farmer” mode. At the end of the day, a farmer can’t survive in this world; at best, it’s a fantasy. I’m happy he’s back to being in cop-mode, but this also detracts from his relationship with Carl. I would’ve liked to see more expansion on that and Rick’s quest to move his son in a better direction. -I’m liking Carol this season. As callous as it sounds, the only sympathy I feel for the two girls is because of her. I like her telling the kid that she’s weak; it’s something that the kid needs to hear, and better earlier than later due to the fact that kids have to mature much more quickly in this world. -Piglets are cute, damn it. -I like how everyone is nervous about being infected, but then Rick just goes ahead and sprays himself with infected pig blood. -At the end of the episode, Tyreese finds his wife burned outside. 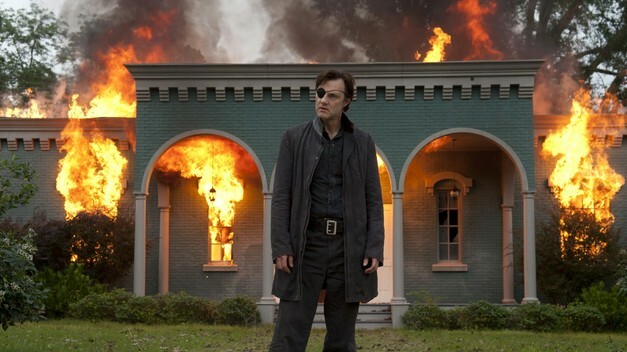 It’s an ominous final scene, and to be honest, I hope the Governor didn’t do it. He probably did, but I like the show better when the villain is nebulous; that’s what made the pilot so fantastic. The Governor is fun, but true horror arises when you can’t even trust those around you.